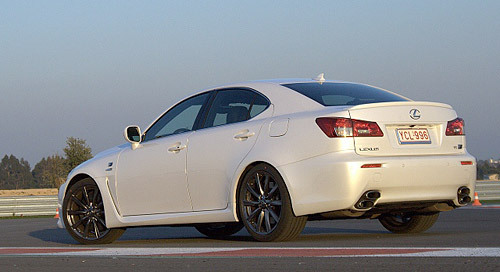 For Lexus, this section is key to the IS F being taken seriously as a performance car for real driving enthusiasts. The competition is not only fierce, but established. Car nuts know what to expect from BMW, Audi and Mercedes in regard to focused performance cars, but until now Lexus will not have featured in their shortlist of sport saloons. If our first inklings are anything to go by, that will change very quickly. As more and more cars achieve impressive on-paper figures, it’s how they deliver their performance that sets them apart, and the IS F scores highly with linear and seemingly endless acceleration. This is an interesting review, as it’s squarely aimed at the true enthusiast, and reads well. One thing that’s mentioned, and I think it’s a very valid point, is that the IS-F and its competitors are really quite even in terms of performance figures, but it’s the way that performance is interpreted that makes all of the difference. Ranking these cars in any way, unless it’s purely by the quarter-mile and 0-60, means that a person’s own preference and expectation plays the leading role.